I don't know about you, but I am always looking for ways to keep my skin looking young. Unfortunately I was a lifeguard growing up and spent many summers baking in the sun. Naughty, naughty Lindsay that's for sure! I am paying for it now with those wrinkles and little brown spots all over my face. Fast forward to getting engaged. Now, more then ever, I am focused on getting my face in shape for my wedding day. Enter Cold Plasma and the Forever Young attitude. 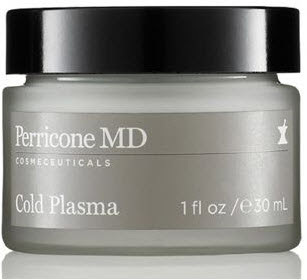 Perricone MD is giving away one jar of Cold Plasma to a lucky reader. Score! I will be trying this along with the winner of the giveaway and I can't wait to see some results. So even if you are not planning a wedding soon or you are already married, what woman wouldn't want to give her face a little treat? BONUS - If you blog or tweet about this giveaway come back to enter again. *Remember anyone can enter you don’t need to have a blog to do so- but please leave your email address in your entry so I can get in touch with you if you are the lucky winner. Giveaway will end Sunday August 15th @ midnight EST and the winner will be announced on Monday the 16th. PS- If you would like to try out Cold Plasma but don't want to fork over for the whole jar, you can get free samples from their site (just pay the $4.95 S&H). or maybe you need a new summer moisturizer, try out the Face Finishing Moisturizer. Also the book Forever Young is available for pre-order on Amazon right now. If customers pre-order the book now, they can get a free Concentrated Restorative Treatment, a $75 value! I have such fair skin and I would love to use Cold Plasma to help remove some of my sun spots from my days as a lifeguard! Too much stress is causing a little more aging than I'd like...I'd love to try a new product to help! I have uneven skin tone and would love to try this to see if it would help. I'll be 60 next year, need I say more? I love to take care of my skin and I have since in my 20's so I'd love to try the Cold Plasma I'm sure it is just wonderful. I just found your blog from Blue Hydrangea! Summer has been really harsh on my face! My face would really thank you if I won Forever Young! Oh my gosh, I have wanted to try this since it was first introduced, but I just can't afford it right now. My skin is pretty good for my age, but my neck shows the signs of too much sun. Great Giveaway is on my site as well! I would love to try this great product I've heard so much about. Thanks for the giveaway! I would love to give this stuff a try. I am finally giving in to the fact that I am not in my 20s anymore and I need to start taking care of my skin! I used to just use Olay and I almost never washed my face at night. Talk about naughty! I need to do better. Maybe having a fancy product will get me on the right track. I could really use this to help reverse all ny sun damage! so i would absolutely love to try this product!!!!! Thanks again for visiting us!! Of course we will follow you! I enjoy your journey. Oh yes, wrinkles, funny spots, rough places--I need it! I'm playing catch-up on my skincare regimen! Ever since I turned 31 last month, I swear there are more tiny crinkly lines under my eyes!!! Say it isn't so and give me the plasma! 30 hit and I got freakin' age spots almost instantly. WTF? ?I need this! Let's see, I grew up in Florida so I damaged my skin growing up, and now as an adult I have a crazy stressful job that takes its toll of my skin (and another things as well). I would love this to make me look a little more rejuvenated. I totally need this- I am pregnant and not sleeping well so I would be nice to have something for my skin- since I will not be getting much sleep in the next few months! I'm such a lame-o, but if you're using this, Lindsay, make sure it doesn't have any of those acids that you're not supposed to use with the wonderbar... You probably already thought of that but just in case. I am 31 and it looks it is time to get serious about skin care! I'm getting married in 85 days (who's counting?) and after many (stupid) years spent in the tanning bed in college, I NEED this!! Great giveaway. Great giveaway! I need it to help my skin look younger. I am now a follower. I am a follower of the blog! I am going to leave a comment for my mom...now i'm not saying that she NEEDS this because I think she is beautiful regardless, but I know she would love to win this and feel "young" again. This would be the perfect thing for her! We'v ebeen married 139 days! Woo Hoo, no more stressing and freakin out. Thank the Lord! But I definitely could use a little help in the skin dept. A few summers back I used a tanning bed EVERY - SINGLE - DAY. Nuf said. I'm a follower and I'm getting old! I've got the Momma wrinkles starting! I'm a follower! My skin seems so dull at the moment, and I'm not sure why! And I'm super bummed about all of the summers I spent lifeguarding when I was a teen are now coming back to haunt my face! I just battled a tough round with eczema and I'm ready to get my skin back on the fast track to looking flawless and radiant! I am a follower! I had a baby 5 months ago and my poor skin has suffered from the hormonal changes:( I need some help! I have heard so much about this product and would love to try it. Years of gardening and hanging the laundry have taken their told on my poor skin ...I need help!! Follower! I need Cold Plasma because I can't seem to find a product that is helping my skin tone :( Maybe this one will be it! email bkimmell at gmail dot com! I'm your newest follower but I have been a reader for a while now. Love your blog. Can't wait to hear about your results with this product!! Hope all the wedding plans are going smoothly! p.s. thank you for the bd wishes!! As a mother of 4 under the age of 7, I could use all the help I can get!! A little treat for myself would be a nice change. Thanks for doing such a fun giveaway! my skin is looking sad, it definitely needs some help! I'm a stay-at-home mom of two, and I do NOTHING for my skin. Maybe a fancy product would be just the motivation. Thanks! I need it b/c I am a teacher and make crazy faces all day to keep my students' attention and wouldn't you know it? My face is starting to stick that way. You win, Mom. I will be starting graduate school this fall, a couple years behind schedule :), and want to look my best! Love your blog! I'm a follower, Lindsey, AND I need this stuff b/c the winters down here in South America are parching the hell out of my skin - permanently etching my crow's feet! I would love this for all of the same reasons you listed. I have the fine lines from sun damage and wish I'd listened to my mother with all her sunscreen craziness!! I live in Southern Califonia and all my older neighbors have better skin than me (cause they have really great dermatologists!). Surfing, having a toddler, trying to start my own biz..that's why I desperately NEED this product!!! why? i just had a baby and on my to-do list was to order a teeny tiny jar la mer (a major splurge with the new budget busting baby). my skin has been nuts since the baby and would love to find a new product that works! thanks for the give-away. love your blog even with out them! I follow! I just keep hearing all this great stuff about this particular product and I'm interested to see if it works for me. Never too early to start preventative measures! I need Cold Plasma to counteract the evil sun shine we are plagued with during these long, humid, sticky, Midwest summer days. Why?? Because my dove soap isn't cutting it anymore!! Given that my birthday is next month, I probably should step it up!! Keeping my fingers crossed! after a younger life of sunworship, and now in older life in the dry Denver area.. I need all the help I can get..
Who wants to be old and UGLY?.. so if it works to soften and restore..
then I'm all for it! make me the lucky winner.. I am hoping for a product to help with brown spots on my face from too much sun. I am a product junkie and would love an opportunity to try a Perricone product! Maybe it would help fade a few brown spots! Seriously!? What woman doesn't need this? Even if it does nothing, but make you feel good about yourself. Love. Ever since I turned 30 I feel like me skin is aging in fast forward! I still feel young, but am starting to look old. help! I have absolutely TERRIBLE skin. I need this to give me the youthful skin I've never had! i'm excited to try a new product! I am a follower and love the idea of a miracle in a bottle. My skin is dehydrated from the desert air in Boise and from a few too many days spent under the sun. my reasoning: I am old. I have freckles. I work full time and have 2 kids. I need something in a jar to make me feel purty. I would love to win a jar of this cream! I am turning 30 VERY soon and I am very interested in finding the best anti-aging cream on the market. I have spent the past two weeks on vacation in the sun, and I am in dire need of some restorative facial cream. Thank you!!! BECAUSE 5 kids in 2 years has aged me 20 years and I need a slight rewind. If I could find that in a jar then that would be a happy day. Because I just turned 40 and just had my fourth child. My skin, among other things, isn't what it used to be. I'm a follower and getting married! I'm def worrying about 'good wedding skin.' I only recently started taking care of my skin so I'm doing what I can (now) to keep it healthy for when I'm older. Thanks for the giveaway, Love your blog! I've logged too much time at the beach this summer, so I need a little cold plasma in my life. Like you, I lifeguarded for years and it shows! I thought that being pregnant would give me the famed "glow", but I'm looking more haggard than ever! Like many others I need to erase the evidence of early sun worship! because I'm 30 and finally taking care of my skin - good luck everyone! I'm creeping up on 30 and have been trying to take better care of my skin, trying to help undo some of the sun damage I did in my teens and early 20s. Oh what a wonderful give-away day!! Looks like a great product and my (now) 35-year old face could really use a touch of gold. Thank you!! Fingers crossed! Ooh, I need this. Sun spots, wrinkles, dry skin...you name it. I could use this cream.